Ms. Myers joined Pearson & Paris, P.C. on January 8, 2018. Ms. Myers received her Juris Doctorate from Valparaiso University Law School. 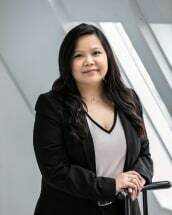 During her law school tenure, Ms. Myers served as Editor-in-Chief of the Valparaiso University Law Review and was one of the founding members and treasurer of the Asian American Pacific Islander Law Student Association. Ms. Myers also participated in the Juvenile and Family Law clinic where she served as Guardian Ad Litem in family related matters to help resolve disputes of parenting time and decision-making responsibility. Ms. Myers also appeared in the Porter County Juvenile Court as a public defender for individuals facing contempt charges for failure to pay child support. Ms. Myers was a recipient of the Hoeppner, Wagner & Evans Scholarship for outstanding commitment to the law school and was awarded the Scribes Award for demonstrating the highest levels of legal professionalism and excellence in legal writing. In May 2017, Ms. Myers was inducted into the National Order of Scribes. Ms. Myers is sympathetic to the emotional strain many families endure in the field of domestic relations. She uses her passion and empathy to advocate for her clients, while recognizing the unique dynamics of each family and her specific role she plays within those dynamics. She prides herself on her ability to communicate, both orally and in writing, superior work ethic, and her analytical reasoning skills. Ms. Myers is eager to help guide clients to a future that better meets their family's needs. In addition to family law, Ms. Myers practices real estate law enjoys helping individuals buy or sell a home, assisting with evictions, and guiding her clients a with an navigable roadmap of what to expect during the transactional nature of real estate law. Ms. Myers prides herself on reaching resolutions that work for everyone involved.